As you may guessed I started to work on MAC platform with the idea of releasing many of the popular software as native MAC apps. Instead of just porting windows apps, the idea is to actually improve on the applications and avoid dragging any bad designs or decisions from windows code. This means the applications will also look different to maximize the interface potential of each platform. It is a bit nonstandard approach but one that is build for long term benefit. A first example is ReVitalize application. 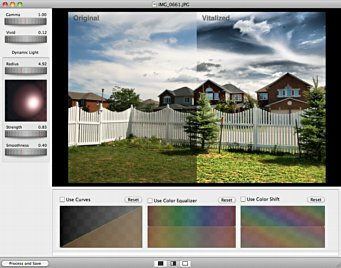 It takes DPHDR/ReDynamix pseudo HDR process and encapsulates it in a native MAC version , where the GUI is different than any of its windows counterparts. But because I think my windows controls such as dial, ball and graphs are rather unique and sort of "signature" so I rewrote them completely in native MAC code. This is all just beginning and I am also working as a sideway on DAP MAC version. The MAC now offers unique distribution method with the APP Store which may very well be a small preview of things to come in the future to all platforms as unlikely as it seems now. Another part of the same equation is the IOS part. Because the differences from OSX are pretty minimal (at least from a Windows developer point of view), it is a good platform to test new ideas even that the huge amount of released applications works now against developers. For few days when the app is featured on first page as new all is rosy. In few days the stream of new apps will push yours towards bottom and out of the first page - and that is mostly all the time a normal app got to capture majority of sales. Once it is out of first page it is a race towards bottom. Pretty weird eh? Here you can see interface using the same "signature" controls on iPad on the DynaLight HD application. This also shows my major gripe with this "central" distribution method. As a fast coder I am actually few versions ahead of what is released in app store. The update for my iPhone app has not yet been approved and I already have another new version.... so right now I am two versions ahead. DPHDR users should feel somehow familiar with those screenshots. The graphics on interface is from my Flexaret(TLR camera) my father gave me many years ago and it gots its way to Canada. While I agree that the Apple approval process is somewhat slow and annoying, I consider it a good thing. If nothing else, it adds a bit of protection from malicious apps. Of course, it's not 100%. But it's way better than you can get from Android market, where almost anyone can post anything and easily infect large number of devices. Yes that may be a good thing of course. I am abit more worried about the longetivity of apps. As soon as the app is gone from first page, the sales drops amazingly down. Which of course makes the app move even deeper in the popular lists. This works like a really nasty feedback loop. One developer told me that the app she worked on for months generates now enough to buy her a cup of coffe a day. Of course, it's not easy to become and stay popular amongst the +300k apps. In my opinion, the key of success is a good review from respectable magazine/web. And of course, good word from existing users. What I think would be good for spreading the good word would be a free version of app. Let's say limited by the size of output? It's all about spreading the word. I think the DAP (if ported to iOS) has a great potential to quickly become a bestseller. Why? Because of its iniquity. There is not yet a similarly good and fun to use "painting" app on the AppStore. Basically I have a problem and after trying to do some research of my own I still have not found a solution. I have a WD 500gb external hard drive. The problem is that its read and write on one of my Macbook's but only read only on the other. I just don't understand why?! The format is 'NTFS-3g (MacFUSE)'. If anyone could give me an idea of what to do. Or if necessary how to back the WD hard drive on to my 1TB so I can re-format it that would be great. It's been three years and no Mac version of DAP, or even update to the DAP Express. Should we have any hope, or have you abandoned the Mac platform for some reason?